Emma & Joe catch up over a drink by the canal in Gas Street. The scene can be found at 12m33s into the video. This is the only episode of Hustle to be set in Birmingham. If you watch the whole clip you will see that Victoria Square, Cornwall Street, Alpha Tower, The Mailbox, Symphony Court and Selfridges make appearances, all without the need to pretend they are actually in London instead. After Cliff’s meandering walk across Birmingham from Victoria Square he finally ends up at Gas Street when he buys an old canal boat which he transforms into a luxury water home. A few things to note here. Freeze the video at 02m50s and you will see the now sadly demolished grand Church of the Messiah on Broad Street which used to be located roughly where Ozzy Osborne’s Star now stands. At around the 04m00s mark you may notice that the skyline behind Cliff is a little bare as this clip pre-dates the Hyatt Hotel development by about 15 years. One other noticeable absentee is the canal bridge which was added much later, in this clip the wooden swing bridge is the only way across the bar lock. The character of Wilf Harvey first appeared in Crossroads in 1972 and appeared regularly until the death of the actor Morris Parsons in 1976. The exterior of his canal side home was this cottage in Gas Street basin. The character of Vera Downend lived on a canal barge in the basin. 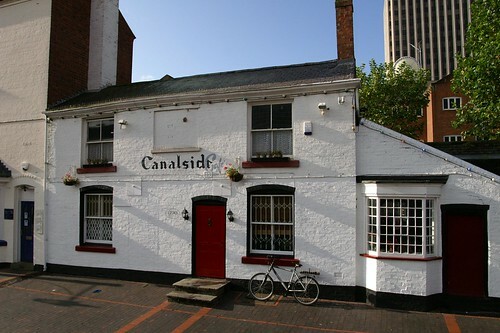 The Canalside Cafe was the location of the canalside cottage owned by Wilf Harvey in Crossroads between 1972 and 1976.